Most of the smartphones used in the world, including India, are Android. These days, smartphones are used for mobile banking and for many purposes. If your smartphone comes in the hands of a hacker, then you can become a victim of trouble. All your personal information may leak. So today we are going to tell you about 10 Security features of Android phones, which can help you keep your smartphone from hacking. We use the easy-to-remember password in our smartphone, which can be easy for someone to hack. To avoid this, you can use a password manager who can hide all your passwords behind master password. Many times we install an app that is shared with somebody, so that the phone has a risk of viruses coming in. Also, it also threatens to leak your personal information. We often use an easy password to lock your smartphone that can be easily remembered. But doing this can be very dangerous for you. 1234, 1111, 0000 Do not forget about these types of passwords. Your smartphone can be open and hacked. We use public WiFi to protect our mobile data. These public WiFi are used by users other than you. In this case, the risk of data theft or leakage is greater. Never send any sensitive or extremely important data via public WiFi. Using virtual private networks can be the most secure option for you. Through this, your data protection gets an additional layer. Android periodically removes the Security tab for the operating system for its users. Never update this update and update your phone. As with your smartphone, keep updating app installs from time to time as well. This is rollout of security patch of apps as well as your phone. Android smartphone runs on Google account In this way, you must enable Google to-Factor Verification to secure your Android device. In this case, your phone gets extra protection. To prevent theft of your data in the event of theft of the phone, enable remote lock and wipe data in your Android. If your phone is stolen, you can log in to your Google Account from a laptop or a PC and delete your data by accessing it remotely. Hackers can send you a link using SMS. In such a way, before making any link open, make sure the link is secure. You can get many mistakes in most fake links. 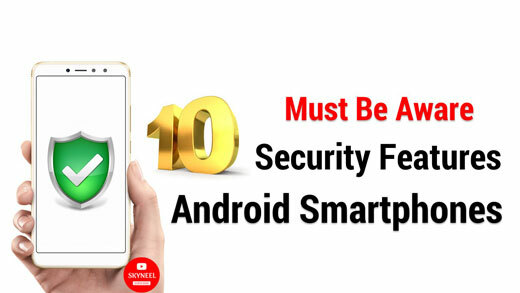 In this article, we told you about 10 Security features of Android phones. If you liked this article, you can also like our Facebook page and also subscribe to our YouTube channel. If you have any problems related to this article, you can tell us by commenting.